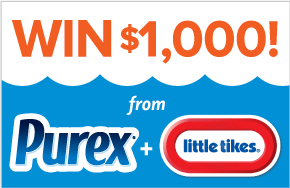 Purex and Little Tikes are teaming up to provide one lucky winner with a $1,000 gift code to be redeemed at www.littletikes.com plus a year's supply of Purex detergent! Summer is winding down and families are scrambling to find the best back to school sales and gear. Purex and Tittle Tikes are here to help your family relieve some of that pressure. So kick back, relax and put your mind at ease as we all prepare for yet another hectic, yet fun-filled school year!